Foothills Church Worship Center, has partnered with Studio Four Design, a top Knoxville architecture and design firm, and with Blount County's leading contracting company, Leon Williams Contractors, to expand. The 32,000 sq. ft. expansion project, which will comprise of a new building, a connecting hallway, and an expanded parking lot, will conclude by spring of 2017 in order to accommodate the growing church congregation. "Our current building facilitates 500, and we average 1100 attendees in our three services. It has become critical that we expand our worship center and we immediately turned to Studio Four Design and Leon Williams Contractors to facilitate our expansion," said Dr. Trenton Stewart, lead pastor at Foothills Church. "Partnering with Stacy [of Studio Four Design] and Jimmy [of Leon Williams Contractors] is once again the best fit for our growth plan. They understand our needs and we trust their expertise in the architecture, design and construction of our new facilities." 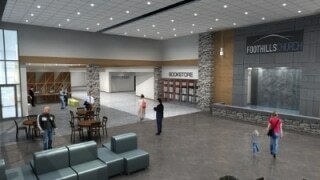 In 2011, Foothills Church renovated a 30,000 sq. ft. abandoned bowling alley and arcade in Maryville to what is now its main church facility. Due to tremendous growth, Foothills Church started holding multiple morning services. Seeing a trend of growth and a need for an expanded children ministry facility, Stewart reached out to Jimmy Hawkins, president at Leon Williams Contractors, to discuss a growth plan. Hawkins will be the main manager of the project, and he plans to have a crew of two to three specialized managing construction members to assist him. "To achieve Foothills Church's vision of providing relational environments for its members, we have to offer compelling spaces for fellowship and worship," said Hawkins. "In partnership with Studio Four Design, we have helped Foothills accommodate their current numbers, so we're happy to partner with them again as they continue to grow. In addition to the expansion, we plan to double their parking space to accommodate the growing congregation, adding a second parking lot exit point to facilitate better vehicle circulation and renovate the existing building for their children's ministry and office space." Studio Four Design, under the leadership of Stacy Cox, president and director of business development, designed the architecture of the new building, as well as the interior of the expansion and connector to complement the existing design of the church. In addition to developing the new space, Studio Four Design will partner with Leon Williams Contractors to renovate the existing building. Additional classrooms and expansion of the second floor are anticipated in another phase of the renovation. "We've had to manage some hurdles with the site, such as complying with Maryville's city ordinance of 30 percent green space," said Cox. "With the two buildings combined, we are able to comply with the ordinance as well as maximize the parking area. We've also faced some challenges with connecting the two facilities, but we have several solutions that should provide efficient traffic flow." Additional consultants working on the expansion project are W. Scott Williams & Associates, serving as the civil engineer, Prosim Engineering, serving as the structural engineer, and West Welch Reed, serving as the mechanical, electrical and plumbing engineer. To learn more about Leon Williams and its dedication to providing quality construction, visit www.lwcontractorstn.com. In addition, to learn more about Studio Four Design and its excellent premiere design and architectural services, visit www.s4dinc.com.